Comprised of dozens of islands sprinkled along Croatia’s Adriatic coast, Kornati National Park is an idyllic retreat for those looking to escape mainland crowds. Remote, undeveloped, and strikingly beautiful, the archipelago abounds with lush forests, desert-like plains, and jagged karst-limestone rocks. Here you can find a surprisingly diverse ecosystem and some of the region’s most vibrant marine life. Most visitors opt to explore Kornati National Park on a full-day boat trip from Zadar. Boat tours typically visit highlights such as Fort Tureta, Murter Bay, the Salt Lake, and the landscapes of Telascica Natural Park. Most tours are either private or small-group excursions aboard a small yacht or speedboat. Plan to spend a full day exploring the Kornati archipelago. Limited visitor facilities, restaurants, and restrooms are located on Kornati Island. Bring comfortable shoes if you plan to hike, sun protection, your swimsuit, and plenty of water. The national park is a protected conservation zone and certain areas are off limits to visitors. Kornati National Park is located in the Adriatic Sea, off the coast of central Croatia. The archipelago is roughly eight miles (13 kilometers) from Murter Island, and 17 miles (27 kilometers) from the mainland cities of Sibenik and Zadar. The park is accessible only by private boat or organized boat tours. 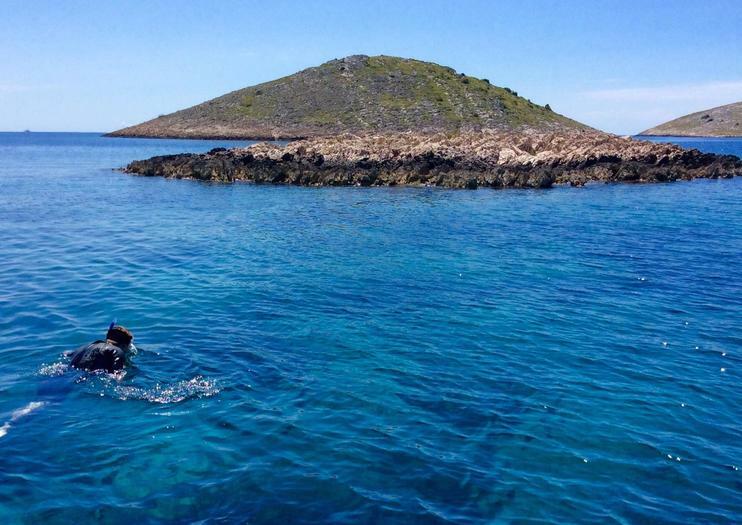 Kornati is open year-round. While summer is the most popular time to visit, it’s unlikely to be overcrowded even in peak season. Winter visitors can enjoy the natural landscapes free from crowds, but be aware that all visitor facilities and restaurants will be closed. The natural beauty of Kornati National Park is undeniably photogenic. Take a sailing tour to soak up the scenery and capture some memorable photographs. Along the way, head ashore to hike around the islands, dive in the Adriatic’s clear waters to swim or snorkel, or join a scuba diving tour. Enjoy a day away from urban Zadar with a boat cruise to Kornati and Telaščica National Parks. Explore the islands’ natural landscapes and look out for native wildlife, touring landmarks including the Blue Lagoon, Silver Lake, and even stopping for a dip in Lake Mir. Enjoy 2 meals served on board and absorb ocean views as you relax, sipping a complimentary aperitif and listening to your guide’s illuminating commentary. Explore two of Croatia's splendid national parks—Kornati and Telascica—on this full-day tour from Vodice. Round-trip transportation eliminates the need to book a rental car, and a guide provides in-depth commentary and navigation as you travel. Sit back and enjoy the scenery, learning about the specifics of each park's ecosystem, flora, and fauna. Cruise beneath the dramatic cliffs in Kornati, stopping to swim and have lunch, then explore Telascica's pine forests as well as the Roman ruins and fishing villages.